(Nanowerk News) Researchers at the Okinawa Institute of Science and Technology Graduate University (OIST) have demonstrated a more robust method for controlling single, micron-sized particles with light. Passing light along optical microfibers or nanofibers to manipulate particles has gained popularity in the past decade and has an array of promising applications in physics and biology. Most research has focused on using this technique with the basic profile of light, known as the fundamental mode. Researchers in the OIST Light-Matter Interactions Unit successfully demonstrated that changing the profile of the light distribution into “higher order modes” provides a stronger optical force that can be used to trap and propel tiny polystyrene beads along a microfiber much faster than if they use the fundamental mode. Their findings were recently published in Scientific Reports ("Higher order microfibre modes for dielectric particle trapping and propulsion"). The shape of light in the fundamental mode. “While it was theoretically proposed that higher order modes would produce stronger forces, this is the first time, to our knowledge, that three-dimensional particle manipulation has been experimentally demonstrated,” said Dr. Viet Giang Truong, a physicist at OIST and paper co-author. Light can take different shapes. Usually, in the fundamental mode, the energy is most intense at the center and gradually fades towards the edge of the beam. Any other light shape is called a higher order mode. For example, the energy pattern can look like a doughnut, with most of the energy contained in a ring, and none in the hole or middle. Scientists can create higher order modes by shining light through crystals. To control particles with optical microfibers submerged in water, scientists guide a laser beam through the fiber. The fiber itself starts with a well-defined diameter at each end, but narrows dramatically in the middle “waist” region. As the light travels through the fiber, it cannot fit inside the extremely thin waist, so it spreads out creating an evanescent field around the fiber. This light field can trap particles close to the fiber surface, allowing scientists to control their position and movement. The light propels the particle in the direction the light is moving. 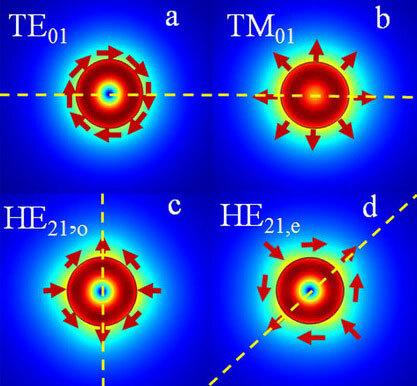 OIST researchers compared how particles react to light in the fundamental mode versus higher order modes, which create larger evanescent fields. They observed that when higher order modes were used, the particles moved up to eight times faster along the microfiber. An increase in speed was expected. Part of the increase is likely due to microfluidic dynamics, explained Aili Maimaiti, lead paper author, and a PhD student from University College Cork, Ireland who is conducting his doctoral research at OIST under the supervision of Prof. Síle Nic Chormaic. As the particle picks up speed, it lifts slightly away from the fiber, reducing drag and allowing it to move even faster. One of the keys to making the experiment successful was redesigning the shape of the glass microfiber so that light does not leak out of it before reaching the waist region where the experiments are conducted. The microfiber starts out at 80 microns, and then tapers down to 2 microns at the waist. Researchers painstakingly create this tapered section by positioning the fiber over a flame and, as the glass heats up, gradually stretching it out until the central region reaches the desired thinness. Maimaiti controlled the shape of the tapered section to ensure that there was very little loss of light through the full length of the fiber. This optimizes the amount of light energy used to control particles at the waist. While the microfiber is very, very thin – about 50 times thinner than a human hair – it is still surprisingly robust for its size because of the characteristics of glass. Optical trapping and manipulation of particles using optical micro or nanofibers has the potential to help deliver drugs to specific locations, such as inside a target cell, measure the interaction forces between cell components, and aid in quantum physics research using cold atoms. Researchers are also interested in using this tool to study the proteins involved in the DNA and RNA transcription and translation processes. In this work, researchers used the microfiber in conjunction with optical tweezers, a tool widely used in research to trap and move individual particles. The higher order mode microfiber helps improve the tweezers by increasing the manner in which particles can be manipulated. In the future, researchers expect the inclusion of the microfiber will also increase the optical tweezers’ sensitivity by communicating more precise information about the trapped particle.